It’s easy to get overwhelmed when researching plastic surgery. Whether you’re getting a facelift or a little filler, it can feel like everybody has an opinion on what’s best and why. We here at RealSelf had a different idea. Why not go straight to the experts? 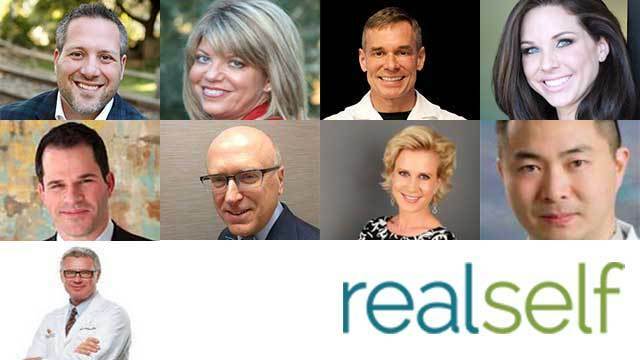 We rounded up some of the RealSelf Top Doctors — those who stand out from the crowd thanks to high patient satisfaction, favorable feedback on expert answers, and lots of positive interaction with the RealSelf community. They shared what they suggest having been patients themselves. 1- Run your short list of doctors by an insider. The best person to ask which doctor you should pick? Another doctor. Whether that means quizzing your dermatologist about the three surgeons in the lead for your facelift or asking the guy who did your nose for a recommendation on a good breast surgeon, the medical community is a surprisingly small place. Just be sure the doctor you choose specializes in the treatment you’re seeking. 2- Here’s one way to tell it may be time to see a plastic surgeon. 3- Losing weight? How fillers might help. For years, Dr. Young R. Cho told his patients how injectable fillers can help slow the sudden aging process many see as they drop unwanted weight. “They feel that they’re looking older and older,” he says of those whose weight loss “creates a hollow or gaunt look.” Dr. Cho decided to follow his own advice after losing 50 pounds, using injectables to keep volume in his face where he wants it. 4- Doctors are scared of anesthesia, too. But don’t worry! Worried you won’t wake up from anesthesia? You’re not alone. Doctors get the heebie-jeebies, too. “I was scared to death,” Dr. Hagstrom says of going under. But remember, you did your homework. You’re in good hands. 5- They struggle with the same internal conflicts about telling their friends and families. “I was terrified about telling my grandparents,” Dr. Dana Goldberg says of getting breast implants at age 28. She’d wanted a breast augmentation most of her life and when presented with the opportunity during her residency, she jumped at the chance. But telling her family, even as a plastic surgeon, scared her. 6- Look for your face. It’s easy to get swept off your feet by stunning before and after photos, but the key is to look for people who look like you. “You want somebody who’s seen your nose before,” says Dr. Gerald Minniti, who got a nose job at the end of his residency. When Dr. Hagstrom got a facelift, he did something that might seem counterintuitive: He grew a beard. “It kind of throws people off when they realize you look different,” he says. He tells his own patients to do the same if they don’t want people to know they got work done; change your cut, color, or facial hair so people can’t quite put their finger on what’s changed. 8- After a breast augmentation, lift with your arms and shoulders. You buy Botox by the unit so save yourself time and money by keeping track of how many units you get each visit. “Patients need to know their dose,” says Dr. Gary Horndeski, a Botox fan himself. “That way when they go back from the next injection they can say if it’s not enough or too much.” Plus, it’ll keep your Botox out of the trash; with an advertised lifespan of 24 hours after opening, anything you don’t use gets tossed. When Dr. Salvatore Pacella broke his nose during a college rugby match, he pulled the classic 20-something move and skipped the ER. Only when he started having trouble breathing a year later did he seek out a doctor who cracked his nose back in place. While the procedure itself wasn’t painful, Dr. Pacella vividly recalls having the gauze, often referred to as nasal packing, removed. “I remember sitting in the exam room, holding on to the exam chair and feeling like my body has been pulled out of my nose,” he says. For that reason, the doctor only uses silicone splints for his nose job patients. See if it’s an option at your clinic if you’re worried about post-op unpacking. 11- Before and afters don’t tell the whole story. “Everybody has good before and after photos. Nobody shows their bad work,” explains Dr. Hagstrom. While pictures are a key part of knowing what you’re getting into, don’t rely on them completely. Reviews matter too. “We all get [some bad reviews] but if you do consistently good work, you shouldn’t be getting too many,” Dr. Hagstrom adds. 12- Don’t be a nail. 13- Ask if your doctor’s had work done. Yes, really. 14- Check out those battle scars. Dr. Hagstrom loves showing off his facelift scar. “I tell patients, ‘I have these big scars in my hairline and I bet you haven’t even seen them yet,’” he says. “They look real close and say, ‘Oh yeah. There they are.’ So when people worry about scars I say, ‘Look they’re right in front of you and you can’t even see them.’” If your doctor’s had the same type of procedure done, ask to see any battle wounds. 15- Getting new breasts? Buy your blouses bigger than expected. 16- Look at results for exactly what you’re getting done. If a friend recommends a doctor, be sure that he or she is good at what you’re having done. Just because your gal pal is happy with her facelift, doesn’t mean her doctor’s also experienced at Botox. “You want somebody who’s really well-trained … who’s going to sit and spend the time with you to talk about both the function and cosmetic [appearance of the procedure],” explains Dr. Pacella. 17- If you’re not ready for surgery, you’ve got options. Ready to hit a homerun? Surgery’s probably your best option, says Dr. Cho, but that doesn’t mean it’s your only option. Since he started getting non-invasive treatments like Ultherapy and CoolSculpting, Dr. Cho has spent more time talking to patients about procedures that don’t involve an OR. Non-invasive procedures can be particularly great for patients who “don’t mind getting to second or third base,” seeing results come in stages, or who can’t afford the sometimes hefty price tag of surgery. 18- Facelifts will make your face look different. Obvious? Not always. Dr. Hagstrom says he often hears patients say they don’t want to look too different after a facelift. If that’s true, then it’s probably not the surgery for you. “You better look different or you’re wasting your money,” he says. 19- You don’t have to go far for good results. You’re special and we’re not just saying that. No matter how many people your doctor has seen, chances are they’ve never encountered your particular combination of features. Make it a requirement that your doctor explain every detail of the procedure. “When you start getting a more customized feel … that’s when you get the wow result,” says Dr. Cho. And really, who doesn’t want a wow?